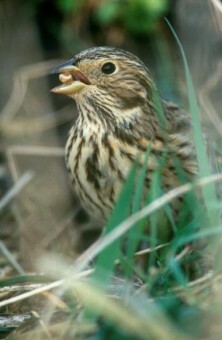 The corn bunting is a lowland farmland bird species experiencing a rapid population decline in the UK, falling by 86% between 1967 and 2008 and 34% from 1995-2009. It is also experiencing substantial range contraction with the population in Scotland now restricted to only two main areas: the east coast between Inverness and Fife, and the Outer Hebrides, with a total population of around 500-700 breeding territories that continues to decline. The population in the Outer Hebrides is now all that remains of a once more widespread population across the inner isles and western mainland. Although the Hebridean birds have persisted whilst the species has disappeared elsewhere in Scotland, the population is declining and is now confined to the Uists. In many parts of the UK range, corn buntings are typical of lowland arable farming landscapes, where they nest in cereal and grass crops and rely on grain and large weed seeds a winter food sources. On the Uists, corn buntings are exclusively associated with cultivated machair, nesting mainly in dune vegetation (the spring-sown crops are too sparse to provide nesting cover for most of the breeding season), and similarly reliant on winter seed sources. 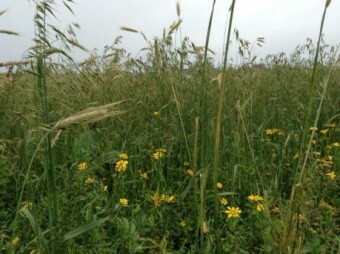 The majority of cultivation on machair is for winter cattle feed with the main crop being spring-sown “corn”, a varying, but highly traditional mix of black oats, rye and barley. Agricultural inputs are low with low levels of fertiliser (inorganic and seaweed) and usually no herbicides or pesticides. 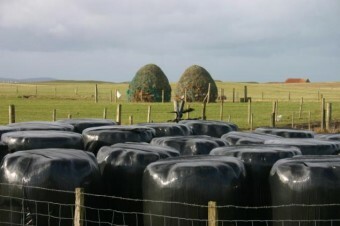 Traditionally the crop was harvested in late September and stored in large outdoor stacks around the farms to provide winter feed for cattle. In the last 40 years, the crop has been harvested earlier in the season (mid August – mid September) and is baled in plastic as arable silage, with a small proportion of the crop being left to ripen in the fields as a seed crop. In response, conservation management interventions have been undertaken to provide overwinter food for buntings since 2004. The Machair LIFE project has also been helping crofters across the Uists with the provision of a reaper/binder machine to encourage the traditional corn management of ‘stooks & stacks’. However, interventions have failed to stop the decline and numbers have fallen to an all time low of under 50 territorial males in 2013, with complete loss from the islands of Barra, Vatersay, Berneray and Baleshare. More than half of the remaining territories are now concentrated in the Paible and Balranald areas of North Uist. At a crisis meeting in Inverness this year, the intervention methods were discussed and assessed. It was felt that some of the methods used have not worked and the scales of the more successful methods were not at a high enough level. This winter the RSPB is working with over 60 crofters throughout the Uists to provide an easily accessible winter food source through the provision of seed for the buntings to try and reverse this decline. Although the Uists have a one of the last large areas of low input HNV farming in the UK, small changes in the traditional practices have had a profound effect upon a once common bird. The challenge for us all is to find a sustainable method that provides a winter food source for the buntings that fits in with the challenges of the modern crofting system.